How do you even begin to search for the right suitcase? There are literally thousands of different styles out there and it can be completely overwhelming. Searching for a new carryon can be tough, but today I am going to outline the 5 Keys to Picking out a great carryon suitcase. And I'll take you through everything you need to know to select the best suitcase for ultra-lightweight travel and I'll share with you the Ultimate Luggage Buying Guide that will take you through everything you need to know to pick out the perfect suitcae. I am so excited to share a new freebie that goes along with this episode. It's the Ultimate Bag Buying Guide for lightweight travel. That includes a printable guide that you can bring with you as you're shopping for your new suitcase. Here's my definitive guide to choosing the right carry on bag. 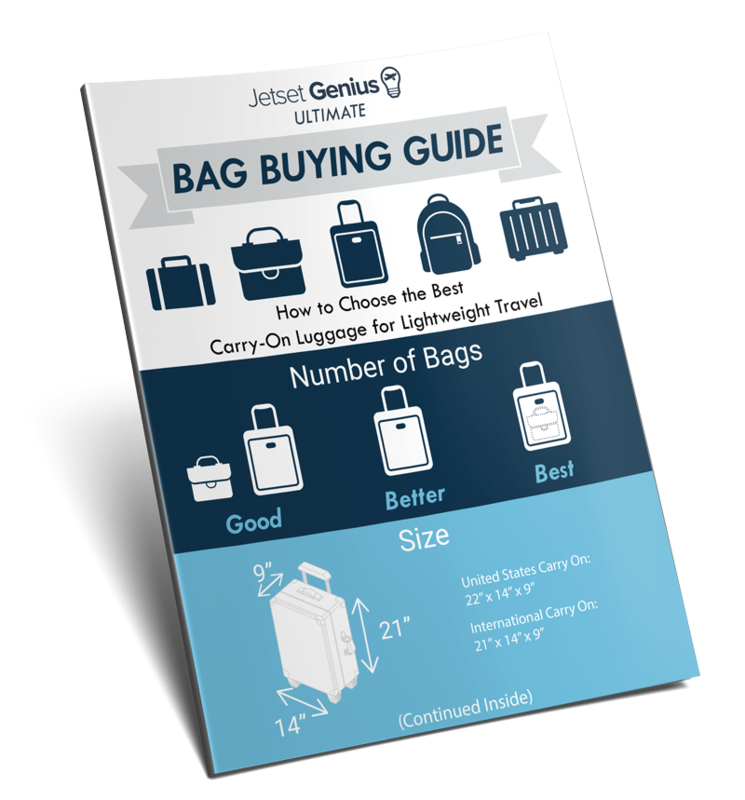 Get the Free Shopping Guide to help you pick out the best suitcase for lightweight carryon travel! As much as we want to avoid the luggage buying process, sometimes it just can't be avoided. Several years ago I was just finishing up a business trip in Seattle and as I was walking through the airport the handle of my roller bag completely broke off! So there I was standing there with people rushing past me and I was just starring at this handle wondering what to do next. Well the handle was broken beyond repair so I chunked it in the trash, picked up my bag and started carrying it through the airport. But rememberd that I had a jump-rope in my bag that I used to workout with in the hotel, so I took it out and tied it to the handle and proceeded to walk through the airport in business attire all the while dragging behind me a suitcase rigged up with a jump-rope handle. What I call my Jump-rope Suitcase. It was a classy scene let me tell you. What made matters worse is that I was leaving straight from this business trip to a fancy vacation resort so I arrived at this nice hotel in Hawaii, dragging my Jump-rope Suitcase. Using a jump-rope when my suitcase handle broke many years ago on a business trip. It was embarrassing for sure. And while sometimes you need a new suitcase because your old one is just worn out, there an even better reason to get new luggage and that's when you're ready to take your travel game to the next level. What bag you choose to take with you has a huge influence on how well your trip goes. Bringing a bag that is slightly too big for the overhead bin can really get your trip off to a bad start. Or if you make the mistake of buying that really heavy luxury brand complete suitcase set because they all match, you'll quickly be wishing you would have opted for something much lighter after dragging it around your entire trip. My guess is that if you're listening to this podcast and reading this article that you are serious about finding the absolute optimal way to travel and picking out a good carry on is a major step in helping you get there. Not all bags are the same. There are good bags and bad bags. Most people simply think about picking out the most durable bag they can find. And they walk out of the store with this bulky leather suitcase that weighs 100 pounds and they wonder why they don't like traveling anymore. Here are five things you should carefully consider when you're selecting your new suitcase. Before even starting the process, think about how many bags you're going to travel with. Are you going to be a One Bag Traveler? Or are you going to regularly pack 2 bags for your trips? Either way you'll want to get clear on what system you're going to use so that you can pick out a bag that works well for that packing method. I recommend One Bag Travel and more specifically Nested Bag Travel, that we talked about in the last episode. We of course are looking for carry on bags only, since as we know checking a bag is a huge waste of time. So we need to keep in mind the maximum dimensions that airlines will allow you to carry on. The trouble here is that every airline has their own size limits. And they can vary in different parts of the world. I'd recommend using the international standard that way you're all set for your next trip abroad. One of the Key Strategies we learned in How to Travel Like a Pro is the important of traveling lighter. We carry our suitcase with us everywhere during our trip and lift it dozens of times so a heavier suitcase can really weigh down if you're traveling all the time. But it's not just what you pack, it's also how heavy your suitcase is. The average suitcase weighs 9 pounds.. empty! I didn't think this mattered much until I looked at the numbers and then lifted several different types and some bags can be 5 to 10 pounds heavier… and that's when it's empty! So do yourself a favor and when you're shopping pay close attention to the weight and get the absolute lightest bag you can find. Now that we know we're looking for a carry on size, light weight bag it's time to start narrowing the search to a particular type of bag. 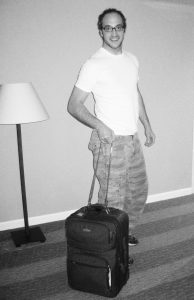 Rolling Bag: This is the most common type of suitcase people travel with and usually have 2 large wheels on one side. While it's a decent option, there are better alternatives out there. Con: The wheels add extra weight and you'll start to cry when you see stairs or curbs. Spinner Bags: These are the latest rage among travelers because they look awesome at the airport. They have 4 small wheels and glide elegantly across the smooth airport floor. But they are a mistake as soon as you step outside. Cons: This tiny wheels are terrible on city streets and curbs… and every where else except in the airport. Backpack Suitcase: This is my favorite type of bag and is starting to be used my more and more frequent travelers. Duffel Bag: Unless you are headed to the gym, this is the worst kind of bag to travel with. Before jumping out and buying another Rolling Bag or Spinner Bag like everybody else, just try a Backpack Suitcase on one trip and I am guessing you'll love it. Next we're looking for the optimal material. Hard Shell: Just like Spinner Bags mentioned above, this is easily becoming the latest trend with travelers and for one main reason. They look awesome! They are sleek, elegant and lightweight. But don't let that fool you, I have seen more people have trouble fitting that hard shell suitcase in the overhead bin than any other bag. If the bag shape doesn't align perfectly with the overhead bin, you'll be forced to check that shiny hard shell suitcase and pretty soon it won't look so great after all. But there's another problem with these, they don't have any side pockets. So to get anything out of your bag you have to open the entire suitcase! And these hard shell bags don't open well at all unless you lay them completely flat. I looked at these for a long time and finally had to come to the conclusion that while they look great, they are not worth the hassle. Con: Don't fit sell in overhead bins. No side pockets. Difficult and clunky to open. Semi-Soft Shell: Most suitcases have some type of semi-soft shell. They are plastic or cardboard covered with some type of canvas material. Most roller bags have this construction. Pro: Often have more give to squeeze into an overhead bin, but can still be a problem. Soft Shell: This would be any bag that doesn't have a hard lining but instead is simply made of the canvas or vinyl material. The only reason more people don't go the soft shell route is they are looking for durability since they're checking a bag. But if you're carrying it with you the entire time it doesn't need to withstand the extra wear and tear from baggage handlers and conveyor belts. Finally, we're looking for the specific features that may differentiate one bag over the other. Here are a few things you'll want to look for when shopping for you next suitcase. I currently travel with the eBags TLS Motherload Weekender and the Ogio Newt Messenger bag. But I also know that picking out a suitcase is a matter of personal preference since we all pack slightly different items. But hopefully these strategies will help you find the perfect bag for you.